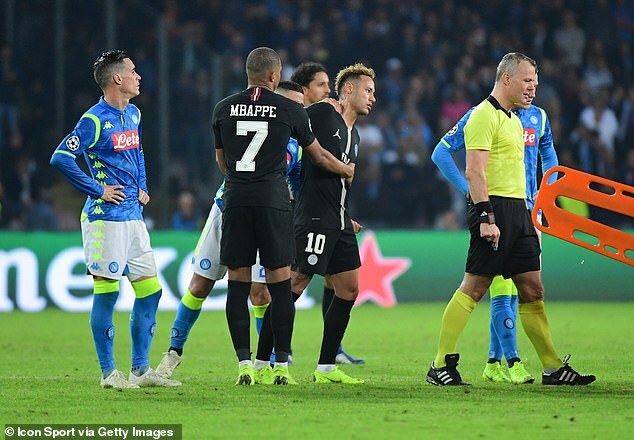 Neymar has called for a senior UEFA referee to be punished after claiming the official said ‘something he should not have’ to him during Paris Saint Germain’s Champions League draw with Napoli. 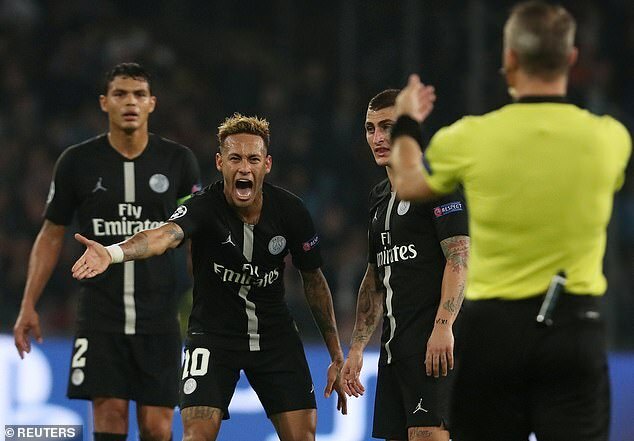 The Brazilian was shown a yellow card by referee Bjorn Kuipers as PSG were denied victory by Lorenzo Insigne’s 62nd-minute penalty. 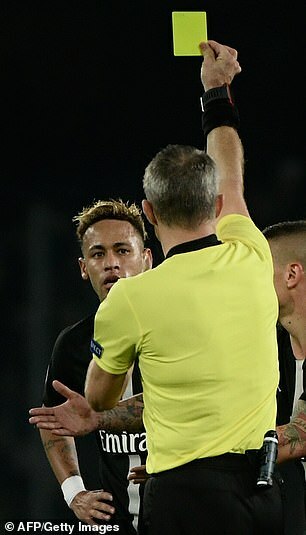 But despite picking up a good away point, Neymar was left furious after the final whistle following an altercation with experienced official Kuipers whom he rowed with at the 2018 World Cup. Kuipers previously told Neymar to ‘shut up’ after a penalty he awarded to the Brazilian was overturned thanks to the use of VAR during Brazil’s 2-0 win against Costa Rica. Amd Neymar was left fuming after the pair’s latest run-in. ‘The referee told me something he should not have,’ Neymar said. ‘It was disrespectful. Neymar was booked in second-half stoppage time as he waited to take a free-kick alongside team-mate Marco Verratti. It is not clear whether the alleged incident took place while he was being booked, or at another point in the match. 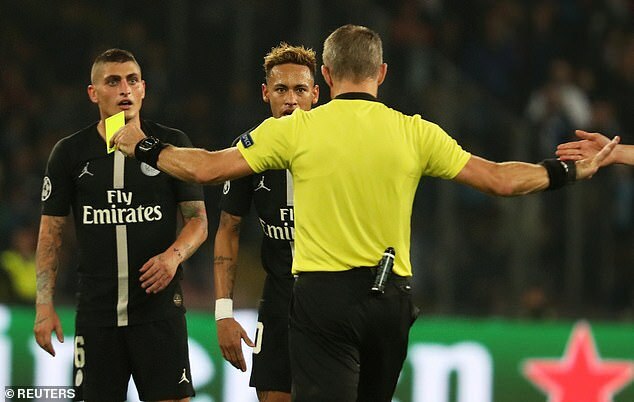 Pictures from Stadio San Paolo show a frustrated Neymar shouting at Kuipers and appearing to be held back and calmed down by team-mate Kylian Mbappe after taking issue with one of the referee’s decisions. ‘He cannot be as disrespectful as he was with me,’ Neymar added. It remains to be seen whether PSG will lodge an official complaint against Kuipers, who has been a FIFA listed referee since 2006. At the 2018 World Cup, Kuipers awarded a penalty to Brazil in their 2-0 win over Costa Rica when Neymar was apparently fouled. But the decision was overturned with the help of VAR technology and the official booked Neymar for diving, leading to protests by the world’s most-expensive player. However, Kuipers angrily rebuked him, telling him to shut up and gesturing to him to suggest he was talking too much. The Dutchman took charge of the 2014 Champions League final and this year’s Europa League final between Marseille and Atletico Madrid. Meanwhile, Napoli moved level with Group C leaders Liverpool after coming from behind to earn a 1-1 draw against PSG. Following the Reds’ surprise 2-0 defeat away at Red Star Belgrade earlier on Tuesday, both teams were looking to capitalise and boost hopes of qualification for the knockout stage. PSG, who are just a point behind in third place, took the lead in first-half stoppage time through defender Juan Bernat. However, Napoli rallied following the restart, forcing veteran Italian goalkeeper Gianluigi Buffon into a string of fine saves before Insigne eventually levelled things up from the penalty spot. The Serie A side, though, could not conjure a winner, with Mbappe firing a late chance wide for the visitors.